A comedy screenwriter has told of the moment he bumped into his idol Donald Glover and was able to tell him how he had inspired him. 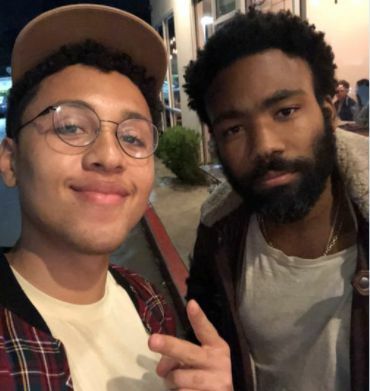 Jaboukie Young-White , who was named as one of Rolling Stone's '25 Under 25' last year, met Glover on 24 March and shared the encounter on Twitter. "I told him that when I found out he wrote for 30 Rock I realised black people could write TV," he tweeted with the photo of them together. "And now I'm a screenwriter and he said he recognised me from Twitter I'm astral projecting. He said I was funny and now I have enough validation to last me the rest of 2k18." The tweet received more than 26,000 retweets and 220,000 likes. Glover began working on 30 Rock after gaining attention via the comedy group Derrick Comedy, as a student at New York University. Since then he has gone onto become one of the most in-demand actors and writers in the US, with recent and upcoming projects including the second season of his hit show Atlanta, a role as a young Lando Calrissian in Solo: A Star Wars Story, and as the voice of Simba in the upcoming reboot of Disney's The Lion King. Young-White, who is based in Brooklyn, now writes for TV shows including American Vandal and Big Mouth. In a profile in Rolling Stone he explained how he uses Twitter as a writing tool, and will occasionally take one tweet and develop it into a five-minute bit.